When discussing access points (APs) with your clients, your conversation might touch upon a range of product features. But which features do tech buyers value most? According to our survey results, customers place the greatest emphasis on security features, cited by 58% of respondents, when evaluating products. While Wi-Fi has had a largely positive impact on organizations, such as greater productivity and collaboration among employees, your customers need the assurance that their networks are secure. As a trusted advisor, you should offer the security features to ensure your customers get the level of security they need. Lisa Phifer, owner of Core Competence, named a few key access point security features that you can include in your offerings. "Every Wi-Fi-certified product supports WPA2-Enterprise authentication and encryption, but what can make a real difference is features such as user/guest management and device on-boarding that make it not just possible but feasible to require every Wi-Fi connection to be secure," she said. The second most-cited feature following security was having dual-band multi-radio APs with MIMO [multiple input, multiple output] antennae, which 57% of respondents selected. 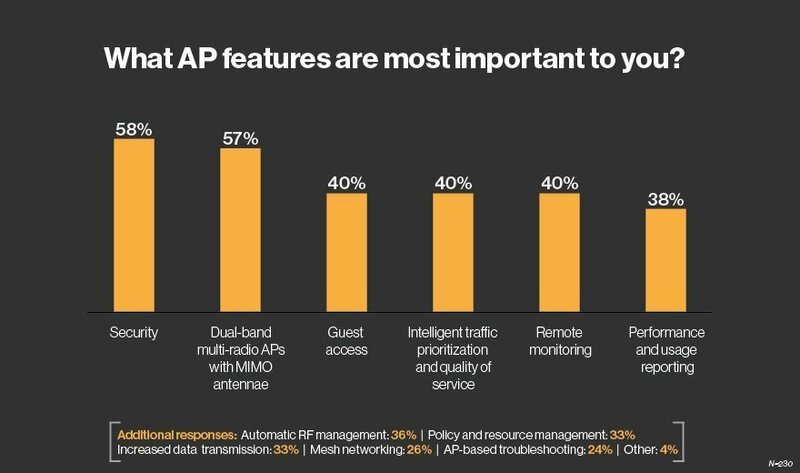 Cited by 40% of respondents, intelligent traffic prioritization and quality of service, remote monitoring, and guest access, were named as third-most important features, respectively. Read tips for uncovering drag revenue in mobility projects. Learn the key skills for capturing the enterprise mobility market. Find out about educational funding for wireless networks. What strategy works best for selling wireless access points?